If the Polish American Congress is the shield of Polonia, then the Polish Falcons of America would be her sword. This national association, with the motto “A Sound Mind in a Sound Body” was born out of a desire to instill Polish nationalism by using physical fitness. This would be done with athletic training, sporting competitions, and military drilling. In Buffalo, Nest 6 would become one of the largest and influential branches of this organization. The first inkling of a Falcons group in Buffalo occurred in 1893. At a meeting at Kosciuszko Hall, Stanislaus Mrugowski, Jan Nowak, Joseph Krysztafkiewicz, and a number of other Poles met to form an athletic organization. They agreed to start one and Krysztafkiewicz was elected present. After three years of little growth, it was decided to reorganize the group and they became Nest 6 of the Alliance of Polish Falcons of America electing Boleslaw Rabierzynski president. With a new fire, Nest 6 formed a bicycle racing group, a band, a building committee, and began offering gym classes for boys and girls. Because of this new passion Nest 6 was selected to host the Fourth National Convention of the Falcons in 1899. As the young organization shone on the national stage it proved its dedication to Buffalo’s Polonia as well. In 1900, the Falcons worked diligently to raise funds not only for a home of its own, but for the Dom Polski as well. By 1903, it had raised $7,000 to build a three-story nest at the corner of Playter and Broadway. At the dedication on September 15, 1904, 10,000 people lined Broadway to take part in the ceremony. 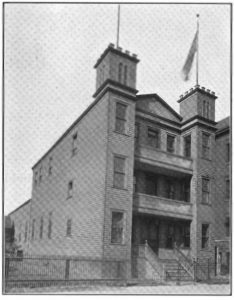 With a building, Nest 6 became the epicenter for all the surrounding nests, so much so that in 1903 it became the District III headquarters of the Polish Falcons. As the early clouds of war began to rumble in Europe, Nest 6 began purchasing arms and training members how to use them as early as 1911. The Falcons knew that if war broke out, it would be the best opportunity to secure Poland’s freedom. This training came to a head in 1914 when Nest 6 again hosted the National Convention, two months after the Great War started. Over 10,000 uniformed Falcons descended on the city, with 2,000 of them participating in a mock battle held in a field near Depew. Sadly, a year after the successful convention the Playter street home of the Falcons was destroyed by a fire. 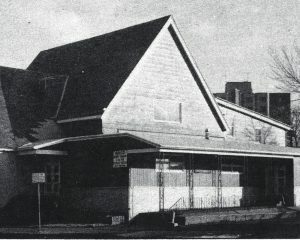 In short order, several local nests combined with Nest 6 to buy the one-time home of the Lebanon Presbyterian Chapel at the corner of Sycamore and Fillmore, and create a new clubhouse. Shortly after this, the Falcons became active recruiters for Haller’s Blue Army, with many members joining to fight for a free Poland. After the war, and a free Poland, Nest 6 worked on more local projects while still focusing on athletics. During World War II the Falcons once again sent men overseas to fight for a free Poland. After the war, the last of the mortgage was paid off and the Falcons owned their nest free and clear. For the next 35 years the Falcons remained a key organization in east Buffalo. Generations of families, all of whom were guided by nest program leader Thaddeus “Mr. Z” Zolkiewicz, kept the Falcons a strong and viable group while others died out. In the 1990s, the members decided to move from Buffalo and relocate to Cheektowaga, where they still remain. "40,000 Poles Will Attend Convention." Buffalo Evening News [Buffalo, NY] 5 Sept. 1914: 5. Print. Napora, James. "Lebanon Presbyterian Church." Houses of Worship. Buffalo Architecture and History, 1995. Web. 27 Dec. 2015. "Polish Falcons In Sham Battle Near Depew." Buffalo Evening News [Buffalo, NY] 9 Sept. 1914: 7. Print. Welcome to the Polish Falcons of America Nest 6 Centennial 1896-1996. Buffalo, NY: Polish Falcons of America, 1996. Print.